I love the look and the feel of well-crafted, luxurious leather products, and the American company, Slate Collection has a wide selection of products that make a big impact as a special gift for your favorite executive or as a well-deserved reward for yourself. They have a full line of accessories that are perfectly at home at your desk or traveling around the world, that make an impressive statement. Luxurious accessories make a statement and if you are looking to make a noticeable and favorable impression at your next meeting, or looking for a thoughtful gift, The ELLIOT BAYTM Folio definitely sets high standards with its expert craftsmanship, good looks, and supple feel. What I especially like about the folio is that it is made from full-grain, water-resistant S.B. Foot American leather making it perfect to guard against life's little spills and can hold up to daily commuting and travel. The folio is available in two sizes, Small, priced at $75, measuring 8.5"H x 6" W x .5" D (holds pad size 8" H x 5" W), and Large, priced at $95, measuring 12.25" H x 9.5" W x .5" D (holds standard legal size pad 11.75" H x 8.5" W). 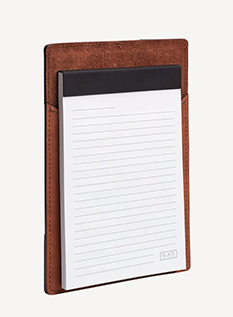 The ELLIOT BAYTM Folio is available in the following colors: Cognac, Indigo, and Midnight. An interesting note about the S.B. Foot Tanning Co. based in Red Wing, Minnesota is that it is the second oldest tannery in the United States and has been producing high-quality leather products for over 100 years. As their products are naturally water-resistant, they do not recommend using leather cleaners, solvents, or conditioners. When necessary, use only a warm damp cloth to clean them. With age, leather develops a patina that gives them their unique character. For you or your favorite traveling executive, the SAND POINTTM Passport Holder is a great addition to make part of your travel routine. 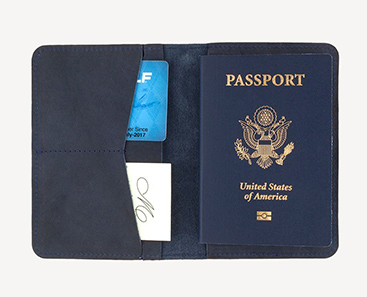 The passport holder not only protects your passport from the wear and tear of travel it also provides an extra level of security by keeping your passport hidden. There are 4 pockets designed to hold your passport, ID, and credit cards or business cards. The American made, full-grain, water-resistant S.B. Foot American leather looks great now and has the craftsmanship that will stand the test of time and age well. Happy travels! Priced at $50, the passpor tholder measures 5.75" H x 4" W x .5" D (closed), and 5.75" H x 8.25" W x .25 D (open) and is available in the following colors: Cognac, Indigo, Midnight, and Slate Grey. To complete your look or as a gift, the BAINBRIDGETM Card Case is very nice. The card case is American made with full-grain, water-resistant S.B.Foot American leather, and has 4-pockets that can hold ID, credit cards, cash, or business cards, and can be used as a small wallet. Priced at $40, it makes a great gift or a perfect stocking stuffer. 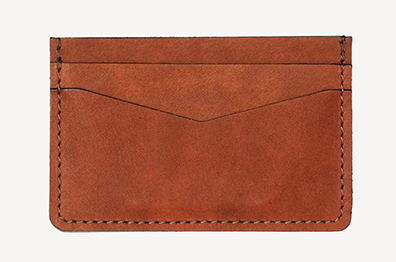 The card case is available in the following colors: Cognac, Indigo, and Midnight. Slate Collection also has a large collection of leather bags featuring totes, satchels, and duffle bags, and smaller accessories including dopp kits, pouches, laptop sleeves, sketchbooks, pencil carriers, glasses cases, eyeglass sleeves, luggage tags and much more to create a fashionable and functional look. American made, well-crafted leather goods that get better with age; create your own legacy. © November 2018. Luxury Experience. www.LuxuryExperience.com.All rights reserved.